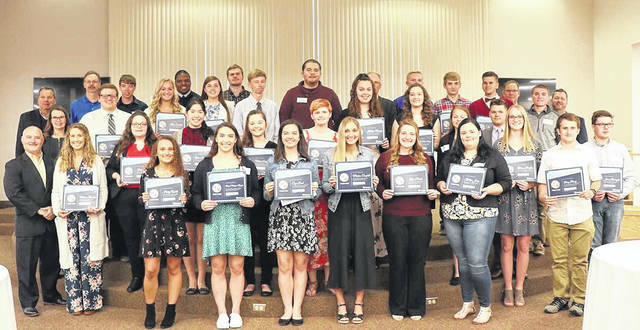 Holzer Health System recently honored outstanding local high school science graduates at its 36th annual High School Science Awards Banquet, including students from Gallia, Meigs and Mason counties. A complete list of honorees appears in the adjacent story. Holzer Health System recently honored outstanding local high school science graduates at its 36th annual High School Science Awards Banquet. The scholars, their parents and school representatives were invited to attend, where each student was presented with a certificate and monetary award. A representative from each high school who attended the event was presented a check to further their efforts in their respective school’s science programs. The Science Awards Program encompasses high schools from Athens, Gallia, Jackson, Meigs, Lawrence, Pike and Vinton Counties in Ohio; and Mason County in West Virginia. John Cunningham, MS, MBA, FACMPE, executive vice president, Holzer Health System, served as Master of Ceremonies and delivered the introductory remarks. Michael Canady, MD, MBA, CPE, FACS, FAAPL, chief executive officer, Holzer Health System outlined the history of the Science Awards Program. The Science Awards Program honors a student selected by the high school based on outstanding achievement in science and a desire to pursue a higher education. Dr. Mathis spoke to the group about thinking outside of the box and striving toward achievable goals. Eryn Dael Alexander High School, Anru Tian Athens High School, Dakota Doss Buckeye Hills Career Center, Andrew Mayenschein Chesapeake High School, Parker Fraley Dawson-Bryant High School, James Pennington Eastern Local (Beaver) High School, Hannah Damewood Eastern Local High School, Abigail Morgan Naegele Fairland High School, Faith Laughlin Federal Hocking High School, Elijah Baird Gallia Academy High School, Dylan Collier Hannan High School, John Higgins Ironton High School, Haley Webb Jackson High School, Allison Hanstine Meigs High School, Madison Campbell, Nelsonville-York High School, Katelyn Jones Oak Hill High School, Trevor Blank Ohio Valley Christian School, Katelyn Elizabeth Roush Point Pleasant High School, Isabella Marie Moore River Valley High School, Kelsey Marie Olderham Rock Hill High School, Maria Calhoun South Gallia High School, Katelyn Mundy South Point High School, Marissa Brooker Southern High School, Isaac Andrew Whaley St. Joseph High School, Kara Saunders Symmes Valley High School, Ryan Richmond Trimble High School, Kiara Pickell Vinton County High School, Jacob Lloyd Wahama High School, Logan Huber Waverly High School, Dray Remy Wellston High School. https://www.mydailysentinel.com/wp-content/uploads/sites/14/2019/04/web1_4.17-Science-Awards.jpgHolzer Health System recently honored outstanding local high school science graduates at its 36th annual High School Science Awards Banquet, including students from Gallia, Meigs and Mason counties. A complete list of honorees appears in the adjacent story.